Sioux High Tech Software is pleased to introduce our new managing director, Mr. Calvin Nguyen. Calvin is a Canadian with roots in Da Nang. After having been in Canada for over 30 years, he returned to Vietnam where he managed and grew a Swedish software outsourcing company before joining Sioux High Tech Software. He has 20 years of professional experience as a COO, PMO Director, and various management positions in Canada and Vietnam. Calvin is an inspiring, insightful, and growth-oriented leader with distinguished successes in managing and leading people to transform organizations and deliver high standards of excellence to customers. He is a people person and passionate about employees’ growth. Bringing fairness, transparency, and accountable leadership is his strong key message for all Sioux members. He is eager to build a collaborative environment to support employee’s growth and development. The core of a great organization lies in its strong culture. 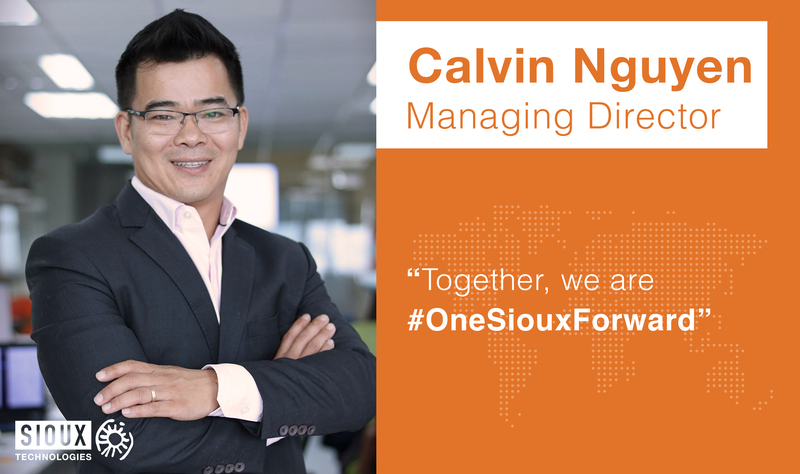 At Sioux High Tech Software, Calvin inspires the spirit of “One Sioux Forward”, incorporating a Culture of Excellence through employee Encouragement, Engagement and Empowerment. Calvin calls this “The triple E to Excellence”. Calvin conveyed a new vision, outlining Sioux High Tech Software’s strategy is to become the full-service provider of choice for innovative and high tech solutions and products in Asia. Impacting the world by bringing high-tech solutions to life. Welcome Calvin to Sioux High Tech Software as our leader. We strongly believe in the expertise that Calvin has brought to Sioux High Tech Software. Together, we are #OneSiouxForward.